Russia has deployed a missile cruiser near Latakia and is ready to take down any aerial targets threatening its airbase near the Syrian city, with long-range surface-to-air missiles. The move was announced on Tuesday after Turkey shot down a Russian Su-24 bomber conducting an anti-terrorist mission in Syria. Ankara claims it engaged the warplane over a violation of Turkey’s airspace, but Moscow denies any violation and accused Turkey of aiding terrorists in Syria. 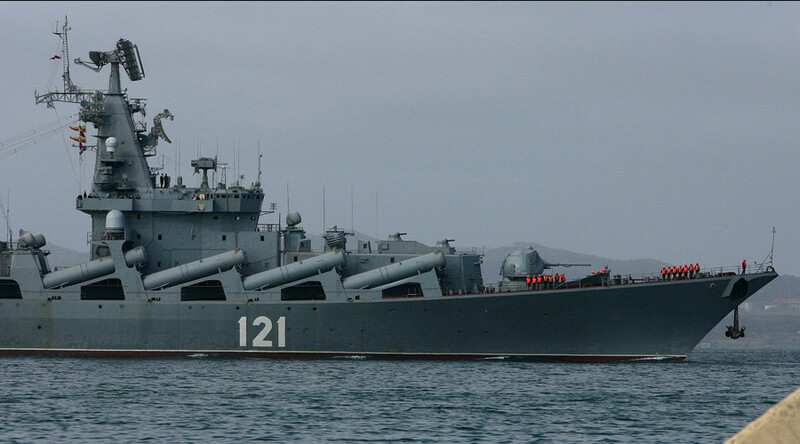 The Moskva cruiser, stationed in Latakia as part of the military buildup, is a 11,500-ton, 186-meter warship serving as part of the Russian Black Sea fleet. In addition to anti-ship missiles, anti-submarine mortars and torpedoes, it has 64 Fort missiles, the naval version of the S-300 long-range air defense system. The missiles can engage targets at a range of up to 150km, which is enough to cover all of southern Turkey from Latakia. In response to the incident, the Russian military in Syria has ramped up security. All Russian bombers will now be accompanied by fighter jets to protect them from possible aggression. Russia also warned that it would destroy any aircraft threatening Russian forces deployed in the Middle Eastern country.